Suffolk House Antiques | A charming George II mahogany chest of drawers. 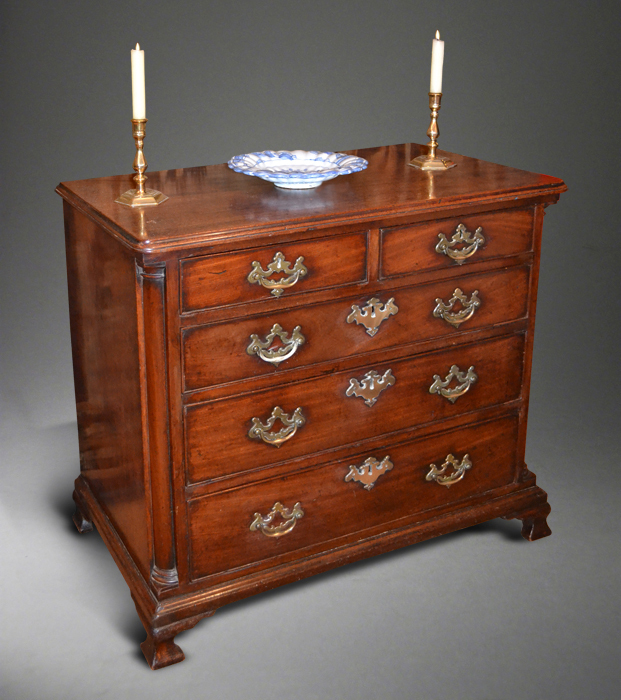 A CHARMING GEORGE II MAHOGANY CHEST OF DRAWERS. It is rare to find a piece of mahogany at Suffolk House Antiques, but I could not resist this lovely little chest of drawers. It has a one piece moulded edge top, two short and three long cockbeaded drawers, quarter columns shaped bracket feet. It is basically in very nice untouched condition including having original handles and escutcheons and has a nice waxed finish. It measures 33 inches wide across the top x 18 1/2 inches deep x 31 inches high. The price is £3450.